One of the biggest tunes of the past few months is eventually nearing a release date (we think?!). 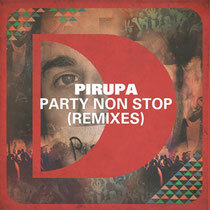 Pirupa’s ‘Party Non Stop’ originally appeared on Locodice’s Desolat label earlier in the year before it was snapped up by Defected Records, who commissioned mixes from two of house music’s best cutting edge producers – Riva Starr and Huxley. If you’ve never heard it, it’s another hip-house style track and if you’ve been following our ‘Tunes of the Day’, you’ll know we’re a wee bit partial to some hip-house magic. Huxley’s mix is the dirtiest of the two, giving it a distinct UK vibe, but definitely making it a bomb for the floor, it’s tough beats with vocal overlay are wicked. Riva’s mix starts off in a funk/breaks style before smashing right into a 4/4 beat as the twisted vocal leads the build up. It then heads off in such a head-nodding, hands-clapping groove that you’re sure to drop this mix in a set too. Two great mixes, no favourite as they’re both so different. We’re hearing possibly rumours of a third remix too, so look out for that one. Make sure to check out both Soundcloud mixes.